As the United States reexamines its borders and immigration policies, the debate over educating immigrant students in our public schools has divided Americans. What can teachers and immigrant students expect from each other? Laurie Olsen, director of a nationally recognized immigrant organization, describes what it looks and feels like to go to school and to teach in a culturally diverse environment. 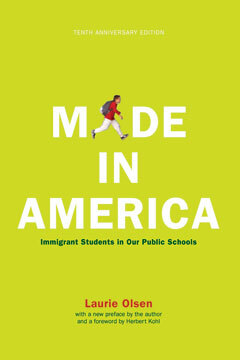 Made in America describes Madison High, a prototypical public high school, where more than 20 percent of students were born in another country and more than a third speak limited English or come from homes in which English is not spoken. Through interviews with teachers, administrators, students, and parents, Olsen explores such issues as the complexities of bilingual education and the difficulties of dating for students already promised in marriage at birth. In the words of Teacher Magazine, “Olsen’s message is clear: celebrating diversity is fine, but it’s no substitute for giving all students a real chance at school success.” With a new introduction stressing the importance of advocacy for immigrant students in a climate of increasing exclusion, Made in America will help a new generation of educators recognize the impact that immigration has on their schools.